The crowning jewel of Prague Castle is without a doubt, St. Vitus Cathedral. You might expect the royal residences would be most distinguished buildings in the compound, but here, the church reigns supreme. 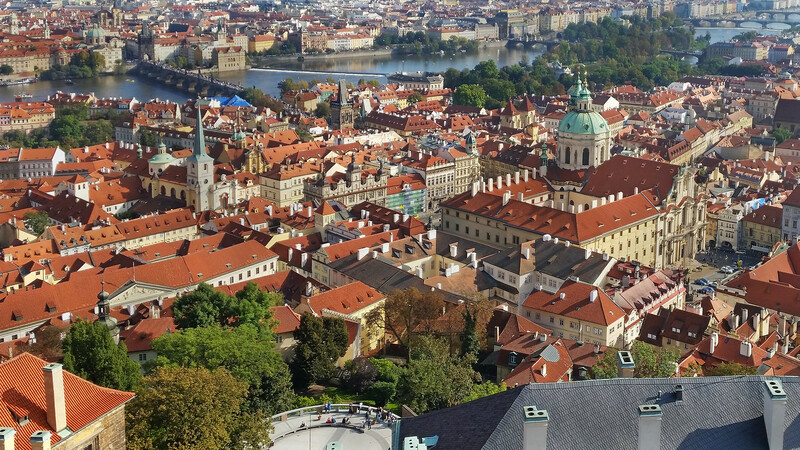 Upon entering Prague Castle, you can see the awe inspiring Gothic towers of St. Vitus poking their heads out above all the other red roof buildings surrounding it. St. Vitus Cathedral is enormous. Exploring it in its entirety might seem daunting to first-time visitors. Spend time studying the details, don't try to take it all in at once. Take a seat inside when you first walk in, allow yourself to take in the design, the layout, the colours, the sounds and even the small. Follow along with this little-guided tour to find out more of the secrets inside these walls. The tour takes you around the exterior and then inside. The tour takes starts at the base of the north tower, following along the north aisles and then around the High Altar and Gothic Chapels, then finishing off walking back down the south side aisles towards the south tower. 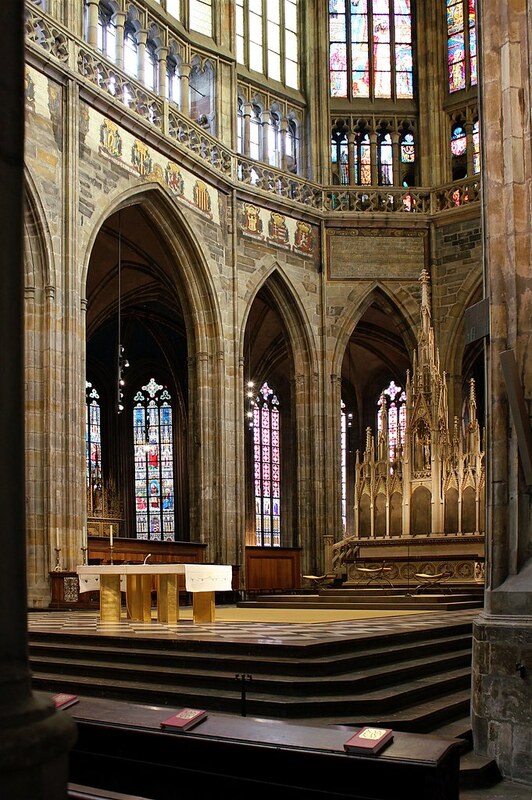 St. Vitus is one of the best examples of Gothic architecture in Prague or anywhere in the world for that matter and should be a must-see sight for anyone visiting Prague for the first time. 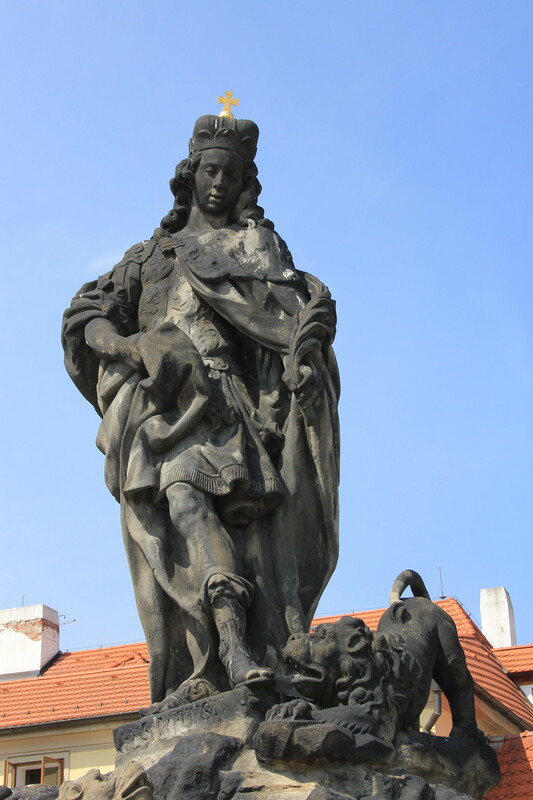 "St. Vitus" was named by Prague's patron Saint, St. Wenceslas, Duke of Bohemia. Saint Wenceslas had acquired a holy relic, the arm of St. Vitus, from Emperor Henry I. Since Saint Vitus had a Slavic sounding name and the Emperor thought this was the perfect relic to convert the Slavic people to Christianity. Saint Vitus is the patron saint of actors, entertainers and dancers. He is also said to help protect against lightning, dog bites and, if you can believe it, over sleeping. Standing in the third courtyard of Prague Castle, looking up at the looming gothic towers, you must remember you are in the same spot where a romanesque pagan temple stood as early as 924. The temple was dedicated to the god of fertility, and many women made the pilgrimage here to pray for a healthy baby. Eventually, the pagan temple was demolished as Christians came to build their Cathedral to their new God. Take some time to examine the church’s exterior. Spot all the different creatures which hang over the roof. You'll see dragons, scorpions, musicians and more. At night these sculptures are all lit up from below, creating a haunting spectacle as their faces seem to move in the light. Although the southern entrance to the Cathedral is no longer in use, walk around the building and look up at what might be the most astonishing part of the exterior - the Golden Gate. This entrance is decorated with colourful and gilded mosaics which combine to produce a stunning scene of the Last Judgement. Unlike the modern western doors, these doors date back from 1370. Since they are so old and delicate, they're no longer in use to protect them from too much wear and tear. To enter the church, go back around to the cathedral’s western doors. As you walk through, take a moment to look at the large, bronze reliefs. Each one is adorned with scenes from the history of the Cathedral's constructions and legends about St. Wenceslas and St. Adalbert. Adalbert of Prague was a missionary who brought the Christian religion, along with St. Wenceslas, to the people of Bohemia. Although the doorways might look old, these designs only date back to 1953. Like many of the world's great churches, construction took ages. It began in 1344 but was not completed until 1929. Even today, the Cathedral is steadily being restored to ensure all the work that went into building such a gem isn't lost to time and the pollution of the faithful. The architect of St. Vitus Cathedral was Frenchman Matthias of Arras who had previously designed the famed Papal Palace in Avignon. Matthias of Arras was a schooled geometer and mathematician, who loved rigid proportions. Matthias is responsible for the heady French Gothic architectural style found so prominently throughout the Cathedral. French Gothic architecture was compact. The transept is short with small chapels. The west front is gracious, with three portals topped with a classical rose window and two large towers. The east end is polygonal with radiating chapels. But the most impactful piece of French Gothic design is their use of height to create an impactful vertical perspective. But Matthias didn't live to see the Cathedral finished. After his death, 23-year-old Peter Parler, son of the architect Heinrich Parler, took over construction. Despite his youth, Parler had real world experience working with his father on the Holy Cross Minster and the Nuremberg Frauenkirche in Nuremberg, Germany. Parler was an innovator and brought his own unique ideas to the Cathedral. He synthesised traditional gothic elements and his more modern ideas, exemplified in the vaults he designed for the choir. These, now named "Parler" vaults, have diagonal ribs that span the width of the choir-bay providing additional strength and also producing a dynamic pattern effect along the ceiling. Parler was a sculptor and woodcarver as well as an architect. When he took over the project, he moved away from the mathematical, structured designs of Matthias and added more naturalistic ornaments. Study the tracery panels, the organic buttresses, window ornaments, the bell-shaped columns, passageway lintels and the busts in the triforium - each one given an artistic flourish that only a sculptor could have conceived. As you walk along the nave, you are immediately struck with a wave of colour and light we well as powerful vertical lines. Above the main entrance is the classical rose window, installed in 1927, which depicts various famous scenes from the bible. On either side of the nave are narrow side aisles lined with small yet elaborately decorated chapels. Many of the chapels are adorned with a large stain glass window. They are dedicated to a particular saint and will often contain a relic or gilded altar portraying scenes of the life of the saint. The Archbishop's Chapel, one of the first on the north side aisle, contains the most majestic stained glass windows. This piece was produced by Czech, Art Nouveau master painter, Alfons Mucha. Created in the early 1930s, the piece was commissioned for the Millennium Jubilee of St. Wenceslas' death. The window portrays the young St. Wenceslas with his grandmother St. Ludmila. Surrounding the centre panel are small vignettes of the lives of Saints Cyril and Methodius who spread Christianity among the Slavs. The first thing you'll notice upon looking at this piece is the saturation of the colours and sharp lines around the figures. Because this pane of glass was painted - not stained - Mucha was able to produce a more impactful artwork filled with powerful organic forms blossoming onto the panels. As you continue walking down the nave, you'll come upon the "crossing". This where the north and south transepts intersect with the nave, creating the "cross" design which is so important to Cathedrals. 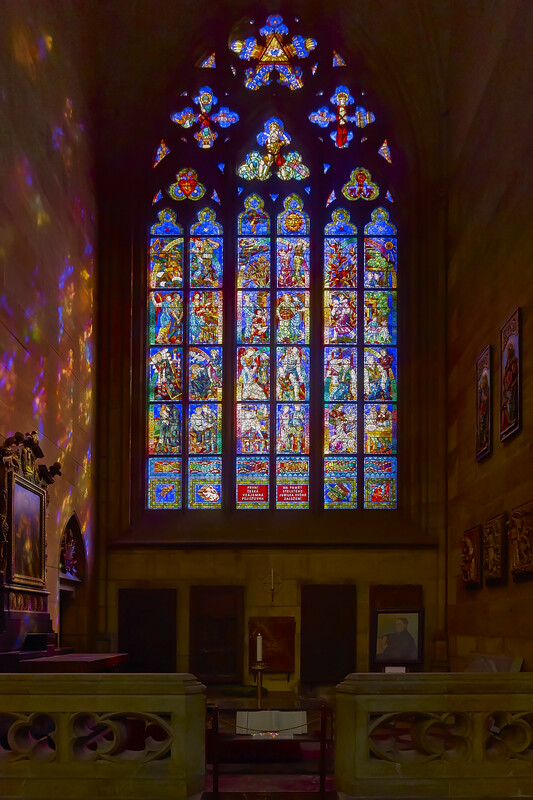 The south transept contains the glittering stained glass window designed by Max Švabinský. This was installed in 1938 and depicts scenes from the Last Judgement, with the fires of hell burning brightly in the lower right panel. The vivid colour in the contemporary stained glass is breathtaking. In the north transept, you'll find the baroque pipe organ. The current organ has over 4400 pipes and was built by Josef Molzer in 1932. The 16th-century Renaissance organ loft houses this musical instrument in what is now one of the oldest parts of the church. Despite all those pipes, the organ is simply not loud enough to fill the whole 125-meter long church. In 2017, bids to build the new organ were being reviewed. They want to build a new loft to house a modern pipe organ with over 8000 pipes - set to be the largest organ in Europe. The estimated cost of this would be anywhere from 80 to 100 million crowns ($3.5 million USD). Below the organ are three carved wooden doors with reliefs of the martyrdom and lives of various Bohemian saints. Standing at the crossing, study the ornamental golden pulpit. Many people have remarked that it is one of the most impressive pulpits seen anywhere in Europe. The entirety of the pulpit is covered in gold leaf and Renaissance portraits of famous Bohemian saints and royalty. The arcade along the aisles contain painted crests of all the Bohemian famlies who have served the realm over the years since the Cathedral's construction. Behind the crossing and in front of the high altar, is the chancel which contains the Royal Mausoleum. The tombs behind the intricate wrought iron gates are that of Ferdinand I and his wife. Each one of their tombs is topped with a hauntingly realistic marble effigy. 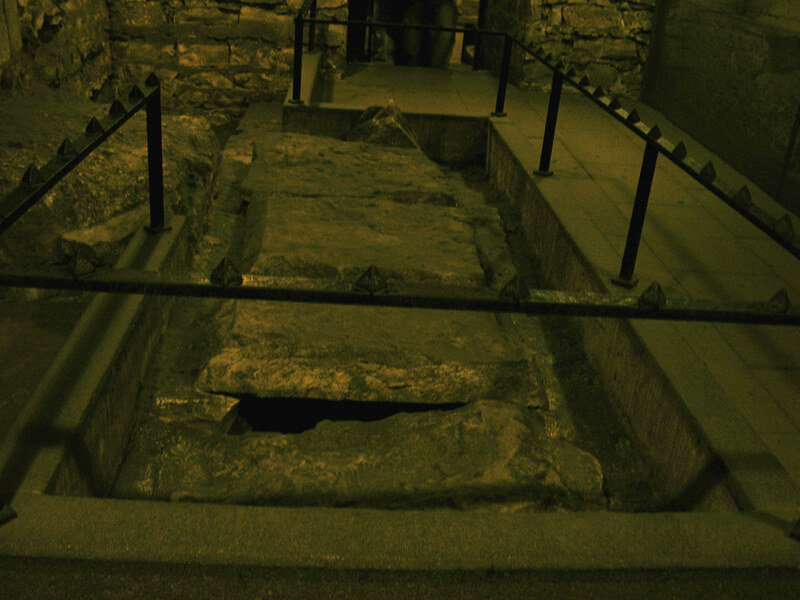 A set of stairs behind the gates leads down to the royal crypt where dozens of Bohemian royals are interred. Behind the Royal Mausoleum is the Choir and high altar. The high altar follows the strict neo-gothic philosophy; tall proportions and fine details. The entire altar resembles the shape of a cathedral itself. 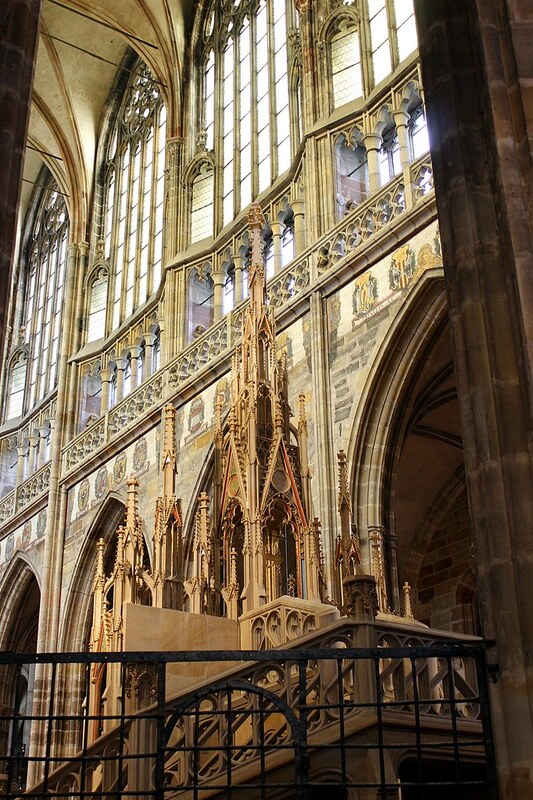 The altar of St. Vitus was the crowning place of all the Kings and Queens of Bohemia, and one can only imagine how beautiful the Royals would have looked in their finery, made only finer by the sparkling interior of the Cathedral. Surrounding the chancel is a ring of Gothic Chapels. Starting on the left (the north end), make your way around, finishing off at the famous, St. Wenceslas Chapel. 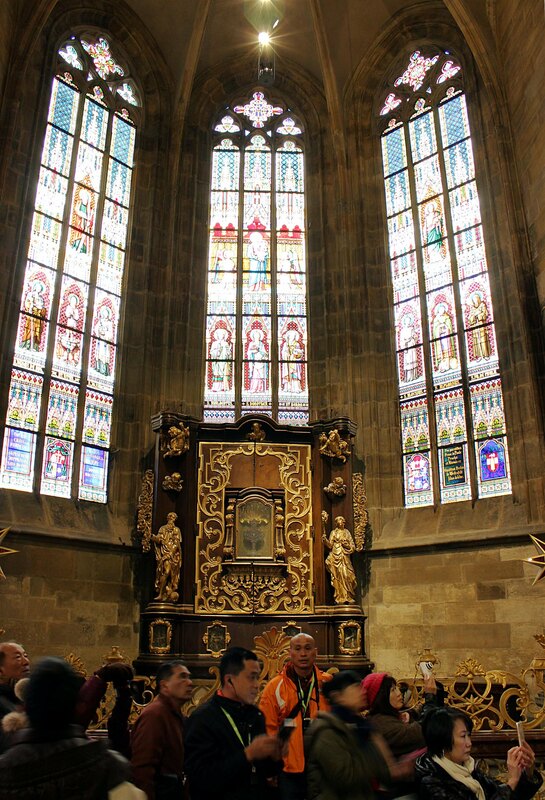 The first chapel you'll visit is of St Sigismund, one of the patron saints of the city of Prague. Designed by František Kanka in 1720, it contains a remarkable red marble altar with stone carved into depictions of the saint. St Sigismund was once King of the Burgundians before he was captured by the King of Orléans and executed. In 1366, Charles IV, Holy Roman Emperor, moved Sigismund's relics to Prague and he has since become one of the many patron saints of the Kingdom of Bohemia. St. Anne's Chapel is next. Standing in the centre is a sumptuous gothic altar. Inside are three white marble saints, the central figure being St. Anne herself. St Anne was the mother of Mary and grandmother of Jesus according to apocryphal Christian and Islamic tradition. Behind the altar is an elaborately designed stained glass window portraying a multitude of saints. On either side of the chapel are two large, painted frescos depicting scenes from the saint's life. The Chapel of St. John the Baptist contains the gothic tombs of Břetislav II, Bořivoj II and the magnificent tomb of Vratislav of Pernstein, Supreme Chancellor of Rudolf II, designed by the Dutch architect Vredeman de Vries. Inside the chapel, there is also a precious historical piece of medieval craftsmanship - a part of a 12th-century Candelabra from Jerusalem. Next is the Lady Chapel or the "Trinity Chapel". Inside the Lady Chapel is a magnificent altarpiece depicting "The Visitation". In Christianity, the Visitation was the meeting of Mary with Elizabeth. Prague was one of the first places in the world to celebrate the feast of the Visitation, at the behest of Archbishop Jan Jenstein in the 1390s. Alongside the altar lies the tombs of Břetislav I, his wife Jitka and Spytihněv II. Many of these beautifully carved graves are the works of the Peter Parler workshop. This meant that even the tombs fit in perfectly with the design of the rest of the Cathedral. On the other side of the Lady Chapel is the great tomb of St. Vitus himself. A sculpture of the saint is carved atop the tomb, set against a background of golden lattice work. The tomb itself is rather subdued and simple. But the most impressive tombs is the baroque, silver encased resting place of St. John of Nepomuk which stands across from the Gothic Chapels. The tomb is draped in a deep red canopy held up by a squadron of divine angels. Two tonnes of silver was used to create this work of art. Saint John of Nepomuk made a martyr by being drowned in the Vltava river when he refused to divulge the secrets of the Queen's confessional. He is now the patron against calumnies a protector from floods and drowning. The Chapel of St. John of Nepomuk across from him tomb contains a cherished relic. Years after St. John of Nepomuk was drowned, his body was pulled from the river and a part of his body, saved in this reliquary. Beside the chapel of Nepomuk is The Waldstein Chapel which contains two beautiful fresco on either wall and a small altarpiece in the centre, behind a wonderfully geometric stained glass window. The Royal Oratory is set along the row of Chapels. It contains one of the most elaborate designs of the Cathedral with ribbed vaulting carved into the balcony to make it look like tree branches, growing from the stone. This is Parler's work and is almost an early influence to Gaudi's 'Sagrada Familia'. But the most important Chapel of them all is St. Wenceslas Chapel. St. Wenceslas was the Duke of Bohemia from 921 until his assassination in 935. His younger, power hungry, brother was found guilty of his murder. Although he was never an actual King, many people know his from the Christmas carol "Good King Wenceslas". The heroic goodness of the duke was well known throughout Bohemia, and years after his death people continued to spread stories of his kindness. He was eventually posthumously declared a King and given a sainthood. From floor to ceiling, this chapel is embellished with the most exquisite paintings, gilding and ornaments. The lower portions of the walls in here are decorated with over 1300 semi-precious stones and paintings depicting the Passion of Jesus from 1372–1373. In the centre of the room hangs a golden chandelier which resembles a grand crown, for the King of Kindness. Inside the Chapel, relics of the Saint are still housed inside his tomb, seen below covered in a red and gold embroidered drape. In the corner of the room, there is a small door with seven locks. This door leads to the Crown Chamber which contains the city's Crown Jewels. These treasures are off limits to the public, except for one day, every eight years, when the seven locks are opened, and these incredible riches can be looked upon by the people of the city. For those of you who have the courage and energy, be sure to climb the High Tower to get some of the most impressive views of the city and courtyards below. The bell atop the tower is named "Sigismund Bell" and was forged in 1549. It is Bohemia’s largest bell and to hear it ring out is a great thing to hear. The stained glass window the back of the chapel depicts various parts of the Psalm in sparkling, vivid colours and with the characters moving throughout in ways not traditionally seen in static stained glass. In the Chapel of the Holy Sepulchre, the large, pink and purple stained glass window draws out all the different 'Acts of Mercy'. There is also an early Baroque altar from 1674 and a picture of St. Mary Magdalene from 1600. The St Ludmila Chapel is located along the southern aisle and is a significant place for Czech Christians. St Ludmila was the grandmother of St. Wenceslas and taught him Christian kindness. She married Borivoj, the first Czech prince to adopt Christianity. Ludmila raised St. Wenceslas as her son after the death of his father. The anti-Christians who ran the country after the death of Wenceslas' father, opposed Ludmila and resented her influence over Wenceslas. Before Wenceslas could ascend the throne, they strangled Ludmila, hoping to end Wenceslas' pursuits of Christianity. Unfortunately, it had the opposite effect, and after her death, Wenceslas was even more passionate about securing his grandmother's legacy. Even if you're not religious, St. Vitus Cathedral is a monumental work of art and must be visited, especially if it's your first time in Prague. The entry is always free so if you feel like you want to visit on more than one occasion to study it up, you can come and go as you please. Step back in time. Step into history. 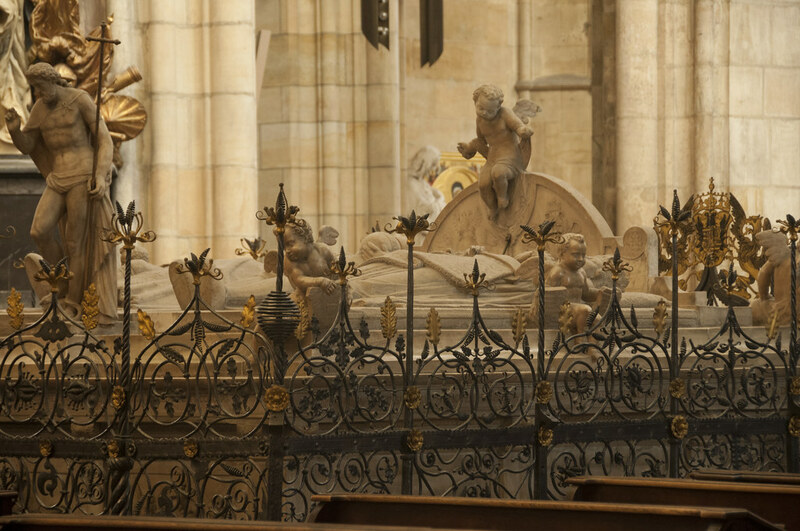 Step into St. Vitus Cathedral.